Since I missed a couple of days recently, I'm featuring two pairs of earrings today - and I think they really complement each other. First I'll start with the light: These sea opal briolettes are handwrapped in sterling silver wire by TheCrazyDaisy. 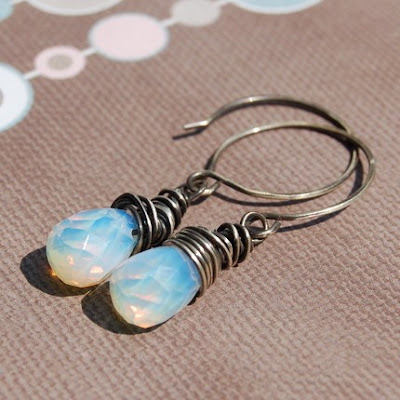 Opals are a huge favourite of mine, and I found these while searching Etsy for them. I love the shimmer of colour throughout the stone. And now for the dark: These dark elegance earrings feature a crystal vitrail Swarovski crystal teardrop handwrapped in sterling silver by queenb. I love how the same colours that appear in the opal are intensified by the black of these crystals. I think if you had a pair of each of these, you'd be pretty well set. 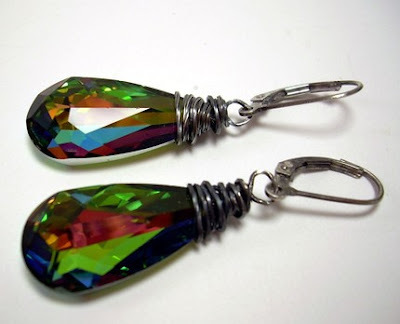 There'd be no need for any other earrings... unless you're addicted to them like I am! These are really beautiful. I've very much enjoyed looking through your lovely blog!